While there are many haunted places in Connecticut, the Lighthouse Inn located in New London remains to be the most intriguing among paranormal investigators. This structure was constructed in the year of 1902. It was originally built to accommodate Charles S. Guthrie in the summer months. The building was notable for being surrounded in lavish fields of wildflowers. As a result of this landscaping feature, it was originally called "Meadow Court". The architect on the mansion was William Emerson, and the individual responsible for the landscaping was named Frederick Law Olmstead. In this guide, you will learn about the history and the hauntings of the Lighthouse Inn - one of the most haunted places in Connecticut today. Charles S. Guthrie's establishment was quite popular among the socially elite individuals in and around New London. Many notable figures to television such as Bette Davis visited the mansion as a way to retreat privately. It has also been established that Joan Crawford visited the mansion. In addition to this, many parties and other social events have taken place at the exquisitely designed building. In the year of 1927, the magnificent mansion took on a new function. It became an inn. The harbor light of New London, Connecticut was located nearby so it was christened "The Lighthouse Inn Resort". In total, there are said to be twenty seven beautifully designed suites contained in the inn. When evaluating haunted places in Connecticut, there are not too many that include the story of a ghostly bride. However, the Lighthouse Inn has just this! 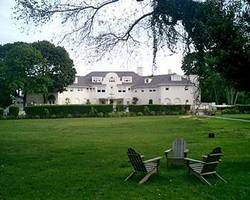 When the inn opened as an inn in the year of 1927, it was so large and luxurious that it decided to allow people to host parties, weddings, and other social events there. At the time, many brides dreamed of having their own wedding in the building. In the year of 1930, a couple arranged to be married at the mansion. All the details were put into place, and the couple was very anxious to have the ceremony. Unfortunately, tragedy prevailed. It is said that as the lovely bride walked down the staircase in the haunted inn, she accidently fell. Unfortunately, the fall was so severe that she died nearly instantly. Since that day, many employees and locals state that the bride has never left the mansion. Many individuals have stated that they have seen the spirit of a young woman dressed in a beautiful wedding gown moving throughout the structure. In some instances, the presence of the ghostly bride is only made known by a gentle breeze for which no explanation is found, or a smell of her perfume. However, despite whether she appears as a full apparition or just by a breeze or a smell, many individuals claim she is definitely there. When it comes to haunted places in Connecticut, there are many stories surrounding females dressed in ancient attire such as Victorian styled dresses. The same holds true for the Lighthouse Inn. Apart from the ghostly bride, it is said that many have witnessed another young woman moving in and around the structure. While no set identity has been established for this female apparition, individuals do associate her with the history of the structure. Many claim that they hear her walking in the halls throughout the night, but many claim that she does not appear to be an intelligent haunting, but rather a residual haunting. There is also a story surrounding a young girl ghost that seems to be haunting the Lighthouse Inn. There is no information surrounding this spirit, either. However, it has been established that she is likely an intelligent haunting. This stems from the fact that several guests have literally seen the doors within the structure opening and closing for no apparent reason, they have heard what appears to be a child running through the corridors, and many have even claimed that they have actually heard the spirit talking, playing, and laughing. As you can see, while there are many haunted places in Connecticut, the Lighthouse Inn is considered to be one of the most popular locations. With the ghostly bride, the female spirit, and the spirit of a young child, this hotel is likely to be very interesting to stay at. Whether you want to experience luxurious accommodations or simply want to do a little ghost hunting, the Lighthouse Inn should be at the top of your "To Do" list.